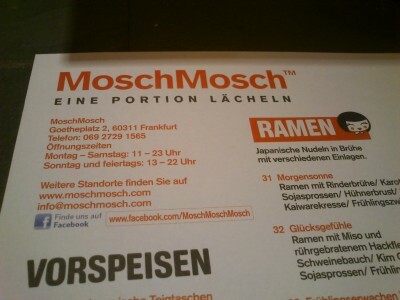 The other day we went to MoschMosch, a Japanese restaurant at Goetheplatz in Frankfurt. The restaurant stretches over two floors, and one of the peculiar things about it is that it doesn’t have individual tables, but rather it has long benches that you have to share with other people. I quite like having space to myself, so we decided to sit at the bar instead. We ordered Kirin and wine and then browsed their menu. MoschMosch doesn’t really cater to real Japanese people, judging by the fact that their menu is in German only, and their dishes have names like Morgensonne (morning sun), Frühlingserwachen (spring awakening) and such. I decided to go for a Höhenflug – the Ramen with salmon and spinach, carrots, spring onions and other vegetables. The food arrived surprisingly quickly and service was friendly. My companion had the Katsu Kare Don, which is a bowl of rice with a tonkatsu (Schnitzel), red curry and vegetables, also very yummy. Dishes are between 8,- EUR and 13,- EUR, so for two people with beer/wine it works out to about 25,- EUR. All in all, it was a nice evening out. Like I said, I’m not a fan of the seating arrangements, but the food was decent and plenty and the service fast.